The outcome of this battle is a 44-year-old statistic, and still you're pinned to your seat. Considering all those racquets, there's hardly any tennis in Battle of the Sexes until the eponymous battle. There are a few surprising things about Battle of the Sexes, Valerie Faris and Jonathan Dayton's fun and breezy retelling of the 1973 novelty tennis match between Billie Jean King and Bobby Riggs: It's Emma Stone's movie, first of all. 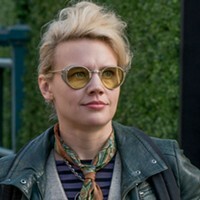 As King, the leading women's tennis player and budding lesbian, Stone is as sharp and charming as she's ever been; Steve Carell as Riggs mostly cedes the scenery to her. Second, despite being cheerfully billed as "from the directors of Little Miss Sunshine" and structured like any populist, crowd-pleasing sports movie you've ever seen, it's casually queer, as King explores with hairdresser Marilyn (Andrea Riseborough) in scenes of gentle, effervescent intimacy. Third, there's hardly any tennis until the match itself, which is thrillingly recreated stroke for stroke, point by point—the outcome is a 44-year-old statistic and still you're pinned to your seat. Carell has struggled in dramatic movie roles, but Bobby Riggs is the perfect combo for him—an outsized, ridiculous personality blanketing a battered soul. (Pity Elisabeth Shue, as his long-suffering wife, doesn't get any depth.) Stone merely underlines why her Best Actress win this year was the right choice, effortlessly carrying an ensemble cast—and major feminist messages still ringing out now—on the temples of her glasses. Tara speaks highly of Blake Lively, I can't believe it.